This Demonstration shows how to construct a triangle given the length of side , the opposite angle at and the difference of the lengths of the other two sides . 1. Draw the segment of length . 2. Draw the circle with center so that . 3. 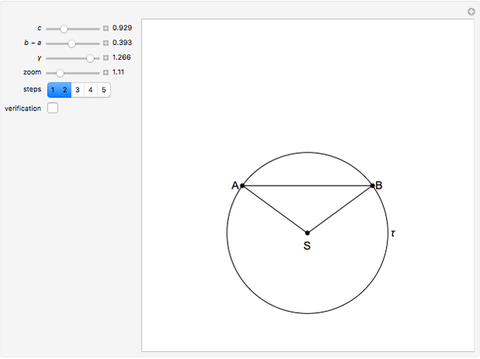 Draw the circle with center and radius . Let the circles and meet at . 4. Let the point be the intersection of the ray and the perpendicular bisector of . 5. Then is the required triangle. 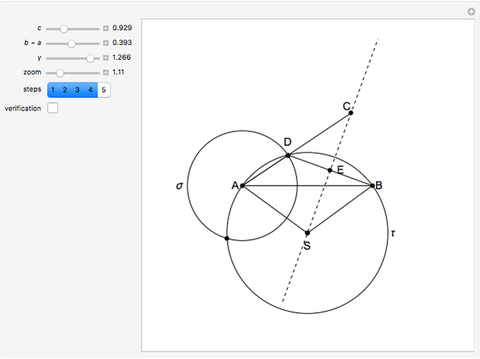 since it is an arc corresponding to the central angle . Since is an isosceles triangle with apex , and . The problem was posed in [1, section IX, problem 2, solution pp. 291–292] and in [2, problem 2, p. 143]. M. Bland, Geometrical Problems Deducible from the First Six Books of Euclid, Arranged and Solved, Cambridge: J. Smith, 1819. M. Bland and A. Wiegand, Geometrische Aufgaben für Hohëre Lehranstalten, Braunschweig: Schewetschke und Sohn, 1865. babel.hathitrust.org/cgi/pt?id=njp.32101076800687;view=1up;seq=143. Izidor Hafner "30. 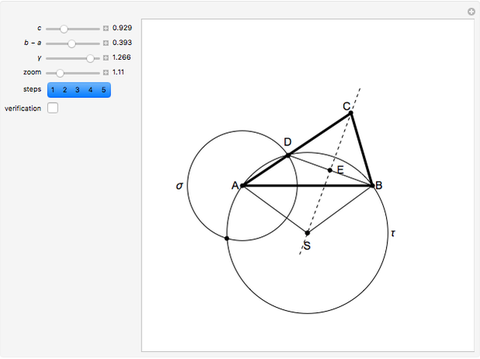 Construct a Triangle ABC Given the Length of AB, the Angle at C and the Difference of the Other Two Sides"